Thank you Florida Dairy Farmers for sponsoring this recipe. 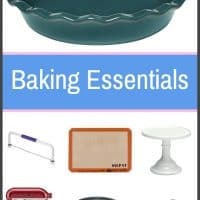 As usual, all my opinions are 100% mine and I love sharing with you brands/products I use and enjoy in my kitchen. I realized the other day that I have not made a single ice cream cake this summer. The travesty of this realization was appalling since last year I made my first and best ice cream cakes ever. 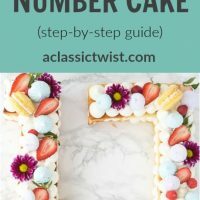 How could I forget that ice cream cakes were a blast to make?? See this birthday ice cream cake and peanut butter chocolate ice cream cake for proof. Granted I was preoccupied with the third trimester of pregnancy most of the summer but still that’s no good excuse to miss out on the ice cream cake train. So I rectified that this week and made this chocolate chip cookie dough ice cream cake!! You know what though?? It took me 4 days to complete the cake and get to the eating of it. Here’s how it went down >> Day 1: bake chocolate chip cake layers, Day 2: assemble cake, Day 3: make whipped cream frosting and frost cake, Day 4: take pictures and enjoy. Ahhh the glories of a new mom life with just 30mins -1 hour nap times. But I can’t complain when now I have an ice cream cake in the freezer for those rough late night meltdowns and snuggles. 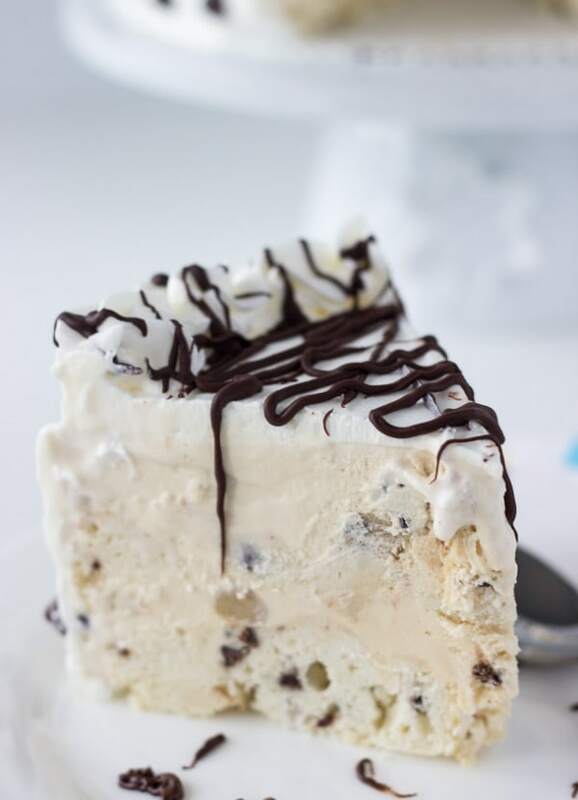 Back to what matters to you… you need to make this ice cream cake before the summer is over!!! 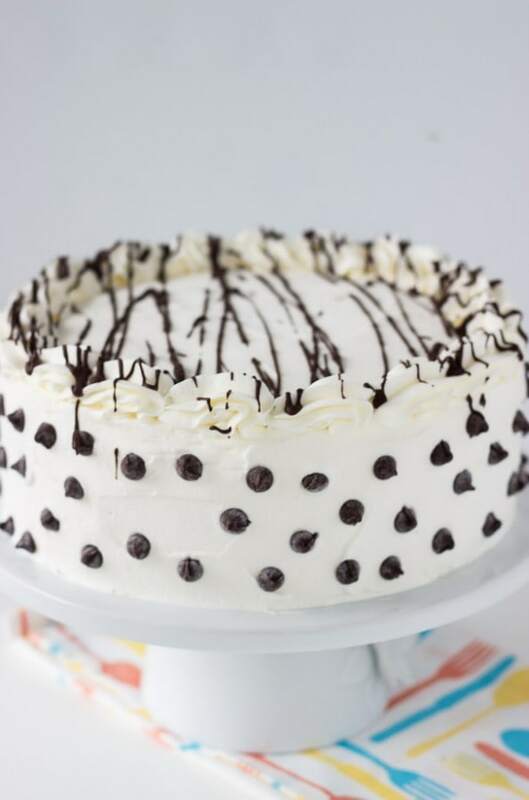 The cake is a simple white vanilla cake adorned with chocolate chips and I used my favorite chocolate chip cookie dough ice cream to fill in the layers. 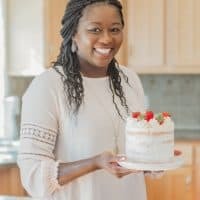 Topped with a drizzle of chocolate ganache, this cake is perfect for a hot summer day and for upcoming Labor Day festivities! 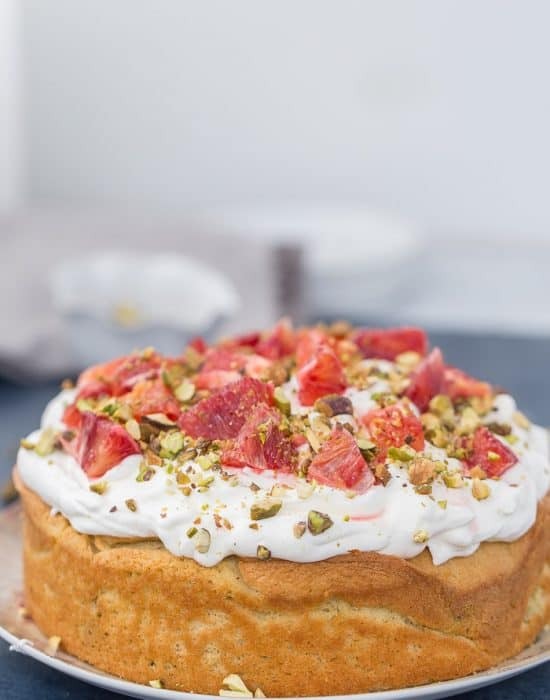 Let’s eat cake and savor the last of these summer days! Coat two 8-inch round baking pans with baking spray, line with parchment paper and spray parchment. In another bowl, beat the butter, oil and sugar until light and fluffy. Add in the egg whites, one at a time until just combined. Reduce the mixer speed to low and beat in the flour and buttermilk, alternatively, starting and ending with the flour. Gently fold in the mini chocolate chips. 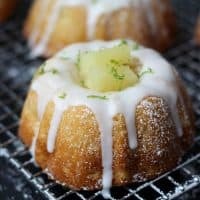 Divide the batter equally into the prepared pans and bake for 18-22 minutes or until a toothpick inserted into the center comes out clean. 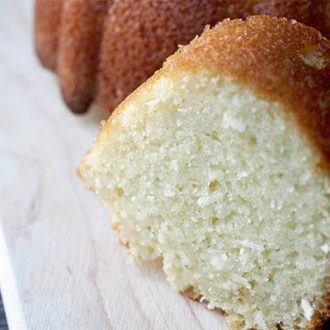 Let the cake cool in the pan for at least 10 minutes before turning out onto a wire cooling rack. Let cake cool completely. You can freeze cake layers before assembling ice cream cake. Remove the first pint of ice cream from the freezer and let sit at room temperature for 15-20 minutes. Use a spoon and mix the ice cream until spreadable. Place one cake at the bottom of the springform pan. Top with first pint of ice cream and spread evenly. Transfer to freezer and let firm up for at least an hour. 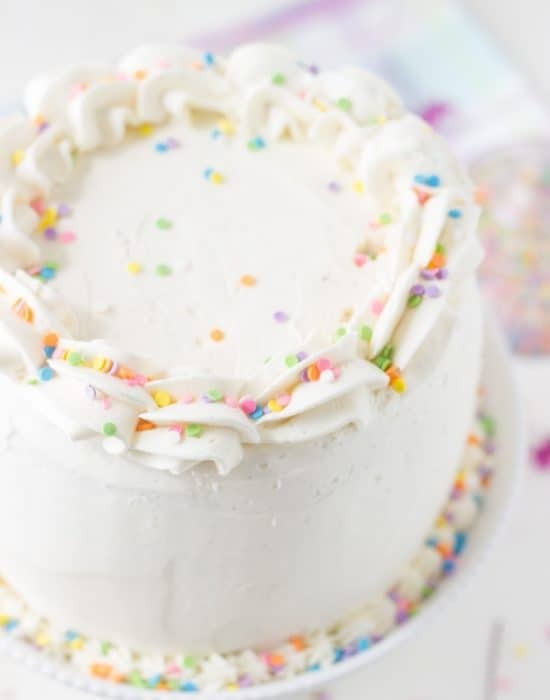 Repeat with the other cake layer and pint of ice cream Wrap cake top with plastic wrap and freeze until firm, at least 3-4 hours but preferably overnight. Using an electric mixer, in a medium bowl whip the heavy cream and sugar until stiff peaks form. Do not overbeat until grainy. 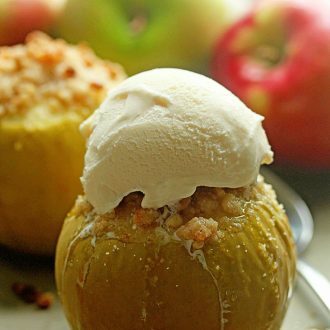 To serve, remove from freezer about 30 minutes before serving. Cut with a sharp knife. I partnered with the good folks over at Florida Dairy Farmers to promote the great benefits of dairy in our diets. They support the local dairy farmers of Florida and spread the goodness of milk and all the dairy products produced locally. For more information, check out their Dairy Facts page. For more dairy recipe ideas, be sure to follow Florida Dairy Farmers on Facebook, Twitter andPinterest. Oh wow, Zainab! 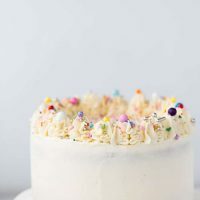 This ice-cream cake looks so adorable and incredibly delish. Yummylicious. Obviously you deserve some kind of mom hero award for making this MAGNIFICENT cake with a newborn!! I am in awe. Hahha no way man! I am just obsessed with being in the kitchen lol! Oh I just love this hun. So so beautiful and so much fun! 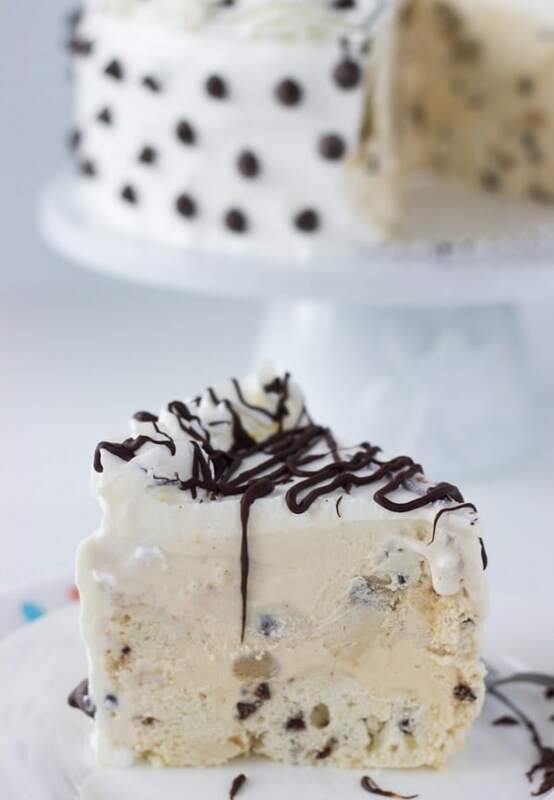 I’ll set aside 4 days if I get to devour cookie dough ice cream cake deliciousness like this! this cake is gorgeous, Z! love! I agree to that!! Lol thanks Lauren! This is one incredible looking ice cream cake! Well worth the time bring it into fruition. Yes to savoring summer and eat all the ice cream! 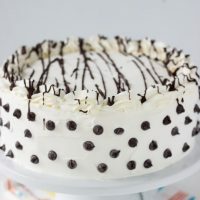 And I love how to decorated the outside of this cake with dots of chocolate chips. It’s adorable! It was too fast right? It’s not too late to enjoy a slice of this! So glad you posted this! I love it! And so glad you didn’t let summer go by without sharing with us a new ice cream cake! Seriously? 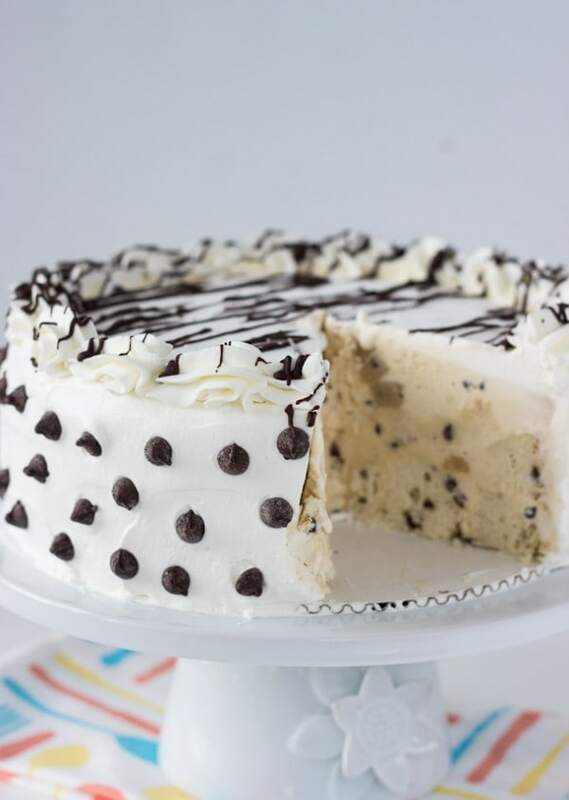 Cookie dough and ice cream TOGETHER in a CAKE is a real thing that exists in the world? I NEED 3 slices of this goodness! Pinned! I have been craving ice cream cake. 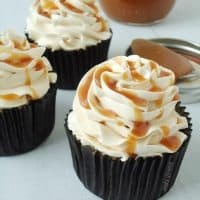 I’ve never made one, but clearly, I need to get started. Awww. I’m sure having this tasty ice cream cake around does a help a bit. Remember it’s only temporary! Your beautiful babe will be sleeping more/crying less before you know it! 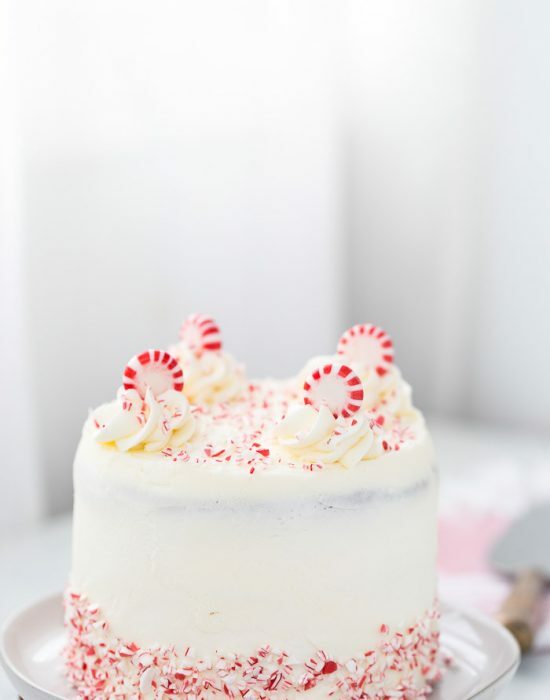 I love ice cream cake, and this one looks incredible! 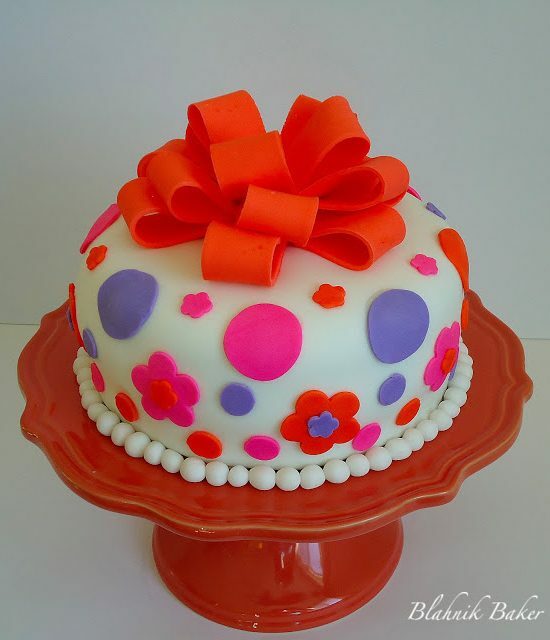 Four days to make a cake – now that is dedication. Saving to try and make next year. 2–COOKIE DOUGH YOU KNOW HOW MUCH I LOVE COOKIE DOUGH EEEEEE! I know how much you love cookie dough! !